An era of sweeping cultural change in America, the postwar years saw the rise of beatniks and hippies, the birth of feminism, and the release of the first video game. It was also the era of new math. Introduced to US schools in the late 1950s and 1960s, the new math was a curricular answer to Cold War fears of American intellectual inadequacy. In the age of Sputnik and increasingly sophisticated technological systems and machines, math class came to be viewed as a crucial component of the education of intelligent, virtuous citizens who would be able to compete on a global scale. 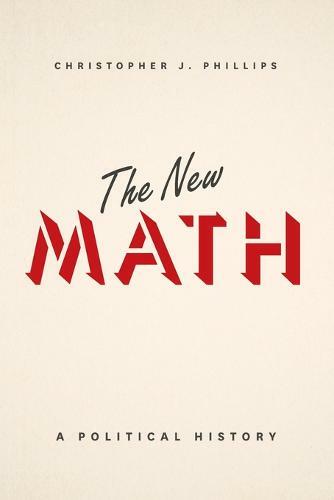 In this history, Christopher J. Phillips examines the rise and fall of the new math as a marker of the period's political and social ferment. Neither the new math curriculum designers nor its diverse legions of supporters concentrated on whether the new math would improve students' calculation ability. Rather, they felt the new math would train children to think in the right way, instilling in students a set of mental habits that might better prepare them to be citizens of modern society a world of complex challenges, rapid technological change, and unforeseeable futures. While Phillips grounds his argument in shifting perceptions of intellectual discipline and the underlying nature of mathematical knowledge, he also touches on long-standing debates over the place and relevance of mathematics in liberal education. And in so doing, he explores the essence of what it means to be an intelligent American by the numbers. "The New Math sheds light on a time when changing political commitments were affecting what it meant to be prepared--mathematically--for citizenship in a modern, technology-laden society. . . . The book is based on extensive research and is incredibly well documented. . . . Likely to stand for a long time as the most thorough, authoritative account of this mid-twentieth-century phenomenon." --Jeremy Kilpatick, University of Georgia "Science "
"The New Math is well written, well documented, and well contextualized. . . . This gem of a book uses its ephemeral topic to shed light on the broader entanglement of knowledge, politics, ideology, and citizenship at the height of the Cold War." --Elizabeth Popp Berman, University at Albany, SUNY "Journal of American History "
"At the intersection of the history of science and history of education, The New Math offers a compelling argument for understanding curriculum reform efforts in mathematics within the context of postwar/Cold War America. Making sense of these reform efforts as a response to the American experience after the war--including the efforts to return to normalcy, the rise of mass/consumer culture, the explosion of an unsettling (for adults) new youth culture, the expansion of secondary education, and the ascendancy of academic (particularly scientific and technical) expertise--enables the story of the new math reforms to shed a broader light on the political and cultural changes taking place during this period. This story provides insights into public perceptions of expertise and the perceived role of the academic (or any kind of) expert in American culture. A quality piece of scholarship." --John L. Rudolph, University of Wisconsin-Madison "author of "Scientists in the Classroom: The Cold War Reconstruction of American Science Education" "
"The New Math is ambitious, rich, and remarkably well-written. During the middle decades of the twentieth century, many groups struggled to articulate what 'mathematics' is, what 'mathematicians' actually do, and how a new approach to mathematics instruction could craft ideal citizens in America's schools. Mathematics teaching became a symbolic arena to sort out competing notions of proper thinking in the nuclear age. Drawing upon an impressive range of sources, Phillips vividly charts the surprising plasticity of 'mathematics' among professional scholars and the voting public in Cold War America." --David Kaiser, MIT "author of "How the Hippies Saved Physics: Science, Counterculture, and the Quantum Revival" "
"Importantly, The New Math explores not just the production of these textbooks but also what happened when they were actually brought into American classrooms and engaged by teachers, students, and parents. As a result, in addition to being a fascinating political history it's also a model of how we can treat the archaeology of the classroom as a way to approach the history of science." --Carla Nappi "New Books in Science, Technology, and Society "